Mexico City is a very quiet place today. All restaurants, bars, discos, nightclubs, bowling alleys and billiard halls are closed. No movie houses, galleries, museums, or cultural programs to visit. No sports events or religious activities such as Mass, either. All Schools from grade school all the way up to Universities, are also closed down. You can visit with friends of course, however most people seem to choose staying at home, connected to their TV sets, telephones, cell phones, or computers. As of tomorrow, no business are to be open either. It is mostly a shut down of the entire system. The reason for this is to try and keep all of us separate to prevent the H1N1 virus from spreading. As if this dire scenario was not enough, we just had an earthquake, 5.8 on the Richter scale; of course this was followed by some very high winds, and I don't even now why I write "of course", but it seems that with the heat and all that is going on, and having the earth shake, high winds would be the natural thing to follow. Well, the result of the high winds, was that the electrical power grid started to shake and all sorts of short circuits took place in the area where we live, as a result of this we then had six power outages during the day. When there is no electricity, there is in tandem no water. The pumps stop functioning. All of this amidst the fear of becoming infected, without being certain how, since all we know is derived from shear speculation. The city appears to have vacuumed off, more than half the population, which is good given the notion that the swine-flu can be transmitted mostly from person to person. The results have yet to be seen. Hopefully for the sake of everyone it will work. This isolation is made even worse, as many airlines from different parts of the world shut down their services to Mexico. The awareness of the shut down, is as important as the need to go someplace. A report from a friend who landed in Shanghai, was that when she chatted with the taxi driver and told him, as a side remark, that she was from Mexico, the man stopped his car and asked her to get out. Or my ex wife, who went to New York for a meeting on a film she is working on, the people with whom she was about to meet, asked her to meet them in a park not in their offices. That meeting was later canceled because the people who were to attend the meeting did not even consider the park a safe middle ground. So much for paranoia. I get the sense of living through scenes out of the sinking Titanic, with many trying to climb onto the lifeboats pushing others aside, and only thinking in terms of their own survival at any cost. I recall the image of the man trying to get on a boat only for women and children, disguised as a woman. It is slowly getting meaner when you look at the world scene and how people behave. People in supermarkets scrambling to get food and filling their carts to the brim even when it is not needed, one woman took all the tuna cans on the shelf at the supermarket.... she will have enough tuna to last her a life time, and mind you there isn't even any scarcity of food here, But other than such isolated instances, which surely can happen any where people start to get anxious, here in Mexico City, people are behaving admirably well, and a level of courtesy and a feelings of "togetherness" as in, we are in this all together, that also comes out in periods of crisis. From the international scene, the sense one derives from the news is that these are apocalyptical times, the messages of solidarity from abroad are few, in the USA, now the back lash against mexicans by those who are opposed to immigration, and those who are a bit less crude, are not all that different in their anti mexican sentiments. There has not been any evidence that this virus is being transmitted by either eating pork, or touching pigs. However for political expediency, Egypt has ordered the slaughter of the countries heard of swine, and they don't even have any porcine flu in their midst. How is that for planning ahead? At the same time, at a news conference in China, one high Chinese official declared that any suggestion that the swine-flu originated in China, was totally unfair to their pigs. In one place they kill them all, and in the other country they honor them. Yet for all that is happening, you should know that ZoneZero is being produced here in the very heart of what is being called an almost pandemic [ the WHO declared yesterday stage 5 our of 6] . We are working from our homes, and making it possible to continue as we have done always. I should have you know our messages to you will arrive without any virus, so do not worry. 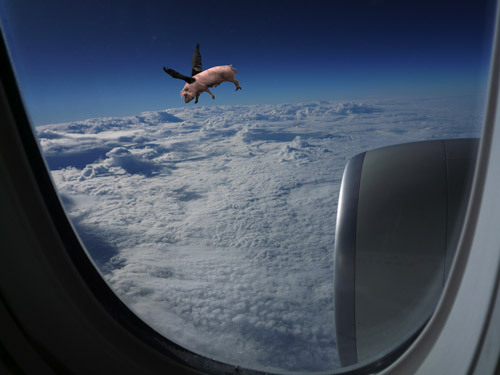 "When pigs fly" is an idiomatic way of saying that something will never happen. As put by the" wikipedia entry: Pigs are heavy animals, without wings, and cannot possibly fly. So "when pigs fly" is a time that will never come. The phrase is used for humorous effect to scoff at someone's intentions to achieve or carry out something which is beyond their previous efforts and accomplishments". . Well, it seems that the time has come, that pigs are indeed flying here, with this porcine flu being at the center piece of our attention world-wide. However all these events might turn out in the end, I am delighted to share with you today, that on the digital front of photography pigs are also flying. As if the fusion of video cameras and dSLRs hadn't blurred enough before, Esquire shot their June issue cover of Megan Fox in video—a purported first in the magazine world. We have written about this in several of our previous editorials, but only now has this become a reality. And this is only the beginning. We invite you cordially to share with us all your own pictures of what is happening in your world regarding this porcine flu epidemic. Con la publicación de Animals en enero de 1977, posee varias canciones relacionadas entre sí por un mismo tema, en este caso inspirado en la novela Rebelión en la granja de George Orwell. En el disco, las canciones «Sheep», «Pigs» o «Dogs» se emplean como metáforas de la sociedad contemporánea. En esta metáfora, los perros («Dogs») son los mandamases de la industria, los cerdos («Pigs») representan a la clase política británica de entonces, aludiendo indirectamente a figuras como la de Margaret Thatcher, y las ovejas («Sheep») representan al resto de habitantes, que se dejan llevar por los perros y los cerdos sin rebelarse. Muchos críticos no respondieron bien al álbum, calificándolo como «tedioso» y «sombrío». La portada del álbum presenta a un cerdo inflable, al que los miembros de la banda le pusieron de nombre «Algie», sobrevolando las chimeneas de la Battersea Power Station de Londres. Sin embargo, el viento que estaba soplando el día en que se tomó la fotografía complicó el control del globo, y hubo que superponer la foto del cerdo y la de la estación eléctrica mediante un montaje fotográfico.Este cerdo se convirtió en uno de los símbolos de la banda, y permaneció como una parte más de los espectáculos en directo del grupo. 1977 informar al publico de la cita de pedro como es que se parecen los conceptos. analisis de la imagen: fíguras retóricas Alejandro Tapia: primero quiero citar su grandeza de la comparación en las fíguras retoricas de Alejandro Tapia viene un Oximoron que es lo contrario a su cita de comparació "el dia que los cerdos volaran" perfecto. generalmente denotar una imagen para la interpretacion es adelantar su significado proporcionando citas. citar lo imposible no es ironico, pero es claro el mensaje, entenderlo así como dicen los grandes maestros de la retorica de la imagen "la ironia" si no sabes interpretar jamas entenderas porque una imagen esta hecha tal cual. como una foto irrumpe y mueve terrenos de lo ficticio a lo surrealista de lo imaginario a lo ironico. esta es una cita interpretar las figuras es citar los conceptos que van desde un mensaje politico hasta uno simple y sencillo el de la "ironia" felicidades su foto denota a Roger Waters de Pink Floyd,AUNQUE EL EN EL 2002 se adelanto a Bush iS A PIG, claro en protesta a la guerra de Irak denoto lo mismo los cerdos no vuelan y que crees impacto tanto que esa imagen al imaginario colectivo le dio tanta Ironia y talento para decir dont´n trasspassing irak, no more injustice in the wordl, en fin quien cita la ironia se debe ver involucrado en eso en despertertar el "colective imagine" lastima en Mexico no vemos a un pedro Meyer en un estadio Azteca despues de un America Chivas o una final de lo que se dice futbol profesional mostrando en una megapantalla "el dia que los cerdos volaron" por situacion tan polítizada que vive este país y manejada a los intereses coincido con usted de unos cuantos. suerte y feliz semana.